Dual Slice CT Scanner with: ,344 Elements of Detector Array, 0.75 Second Rotation, 100 Second Continuous Spiral Scanning X-Ray Tube 6.5 mHu Replaced in May 2005 with +/- 180,000 Slices, Software Rev. 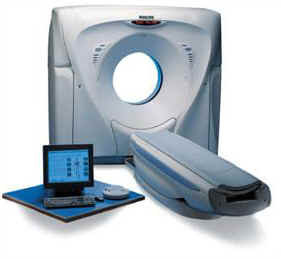 2.64,60kW Generator,Intel XEON Computer; 1 or 2 Image-Second per Slice, 4.1 GB Optical Disk, Options include CT Angiography, 3-D Package, Cardiac Score, DICOM 3.0 with Print, Query / Retrieve and Storage. Available in our Fort Myers, Florida warehouse.